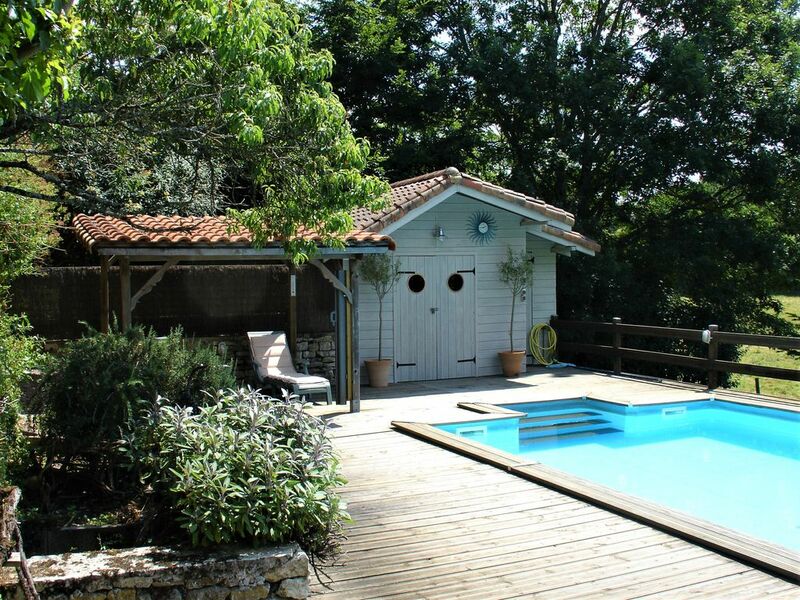 Holiday Home , Private Pool, 3 Beds, 2 Bath, free wifi, 2 Lounges - Peaceful location, less than 1 hour from Vendee coast. This large house is situated in the centre of a small village, the location is quiet and is only interrupted by the church bells twice a day. All of the rooms are decorated and furnished to very high standard, the large kitchen/diner has been fully refurbished and is fully equipped, the 2 lounges allow for visitors to have a little more me time, there is an ample supply of books games and DVDs available to use. the wireless broadband is provided at no extra cost, and recently been upgraded and is now available throughout the property including the garden and the private secluded pool area. The bedrooms are all large and decorated and furnished to a very high standard, the main bedroom has en-suite facilities. The luxurious family bathroom has been completlely refurbished with freestanding bath and seprate shower. The house has large mature maintained south facing gardens which are private. A covered outside dining area is provided with a gas barbecue. A private heated 8m x 4m pool is located in a secluded sheltered area of the garden with stunning countryside views. Sharon and Ken have had their French home for 17 years. Living and working in Devon in a busy small family business we try to visit the house 4 or 5 times a year and have been making upgrades and improvements to the property over the years, its now a comfortable well equipped retreat. Ken is an active Lions club member and several fellow Lions have visited and stayed at the house and enjoyed the peaceful setting in La Reorthe. La Reorthe is a small quiet village in the beautiful Vendee region of France, the house enjoys views to open countryside and the garden and pool area offer a great deal of privacy. The roads are extremely quiet and are ideal for cycling and walking. The Nantes to Bordeaux motorway is less than 20 minutes from the house making access from most ferry ports a comfortable driving distance, and La Rochelle and Nantes airports are under 1 hour away. The Vendee coast has miles of unspoilt beaches and most of these can be reached in under 1 hour. The combination of all the above made us choose this house and feel that it is the perfect "getaway" holiday home. The house is a large comfortable property, which has been renovated, furnished and decorated to a very high standard. We are constantly making improvements and redecorating, last year the kitchen was completely refurbished and has just undergone a full redecoration, and new leather Tetrad sofas have been installed in the lounge. both lounges boast large flat televisions with Freesat satellite programing. For the 2018 season a new TV sound bar has been installed, this will allow for Bluetooth connection to be made from smart phones, iPads etc to stream music from apps such as Spotify and iTunes. A new wifi system has recently (April 2017) been installed giving Wifi throughout the whole property including the garden and the secluded pool area. The private heated pool is set in the lower garden and has been designed using the latest technology for safety and comfort, and a large purpose designed decking area has been constructed to compliment the pool in a stunning private sheltered location. In 2011 the main bathroom underwent major refurbishment, and new outside dining area constructed. Although a peaceful location the towns of St Hermine and Chantonnay are only a short drive away offering supermarkets, banks, restaurants. En-suite to bedroom 2 with walk in shower and WC. Luxury Main bathroom with bath and separate shower, WC. Downstairs cloakroom with WC. Outside WC. Wood burners available for heating if required. Parking at rear of property for 1 car, on street parking freely available. Free wifi provided. USB charging points available. 3 wood burners available in kitchen and both living rooms. 2 x Large fridge freezers provided. 4 burner gas hob, electric oven, new for 2015. Large kitchen/diner with stainless steel oven and gas hob, large fridge freezer, dishwasher, microwave, fully equipped for self catering. Large dining table, also features a fireplace with a working wood burning stove. Large table & chairs in kitchen there is also a covered outside dining area c/w new gas bbq. New dining table & chairs July 2018. Freesat available in both living rooms. New for 2017 season, Sony stereo Bluetooth player available to use from smart phones, ipads etc. 2018 new Tv soundbar, can be used to stream music via Bluetooth. A wide selection of books are available. A selection of board games etc are available. TV sound bar and Sony stereo can be connected via Bluetooth for music streaming such as Spotify, iTunes etc. A wide range of board games etc are available. A selection of dvd s are available. A large well maintained established garden, south facing with lovely views. There are 3 bikes available to use. Covered outside dining area, with gas barbeque for Alfresco dining. A large decking area around the pool is available for sun loungers to relax by the pool, as well as fridge in the pool house to keep your drinks cool. There are a number of quality golf courses in the Vendee, many less than 1 hours drive away. No smoking allowed inside house. An 8m x 4m private heated pool is situated in a private sheltered area in the lower garden with countryside views. Wi Fi available, pool store with fridge. Slice of heaven. Outside: The gardens are south facing and well maintained, situated on 2 levels with open field views and are very private. There are many fruit trees and shrubs and a planted herb garden which is available for guests to use. There is also plenty of lawn area for games and sunbathing etc. A covered dining area with solid teak furniture and gas barbecue is provided. Great for evening meals. The pool is situated in the lower garden to give privacy and shelter. Utility Room: Separate utility room with washing machine, tumble dryer and sink. Ironing facilities provided. Cleaning / Towels / Linen / Maid service: All bed linen is provided and an end of let clean is provided. for long stay guests extra cleaning can be arranged at an extra cost if required. Please note we do not provide towels. Other: Downstairs cloakroom with WC and basin. Thank you so much for your lovely review , we are glad you had a good holiday. Such a beautiful house, tastefully decorated, has everything you need for your holiday, including British TV!! The pool is fantastic, the location so peaceful, but I laugh at the memory of being made jump every day at 7.30pm when the church bells were rung! That's when we were usually sat with a full BBQ belly having a quiet read! Natalie must work like a trooper getting the house clean and tidy because it was spotless! And I should know as I am a B&B proprietor/chief cook/cleaner and bottle washer...The village is perfectly located for the supermarkets and days out, La Rochelle and Marais Poitevin are within easy drive and the O'Gliss Water Park is just AMAZING!! You have great taste in décor and have a great idea as to what people need on their holidays, thank you! We are just so jealous as we always talk of our own little place in France, and you have made us more determined than ever to do it! I would highly recommend to anyone, so if you are reading this, get on with it and book it before you lose out! Hi Melanie, so many thanks for your glowing review, so pleased you had a great time. We try to make the house as welcoming as possible as we visit the house 5 or 6 times a year ourselves. After 15 years Sharon still finds projects for me to complete to make sure I don't get bored so if you decide to visit again you will no doubt see further changes. Beautiful house in a lovely secluded location with lots to see within an hours drive; La Rochelle, Venice Vert, Il De Re, etc. Also a great pool! Hi, many thanks for your kind review and so glad you had a good time. Hi, many thanks for your kind review, we look forward to welcoming you back next year. We were not disappointed with our choice, in fact we were very impressed with No. 19. Ken & Sharon have done themselves proud with this little piece of paradise. The house is everything u cld wish for and then some. The interior is well appointed, lovely large rooms, good quality furnishings and utensils. Everything was thought of and u want for nothing, well, except food obviously lol. Men and kids, (think theyre the same arent they?) will love the 2 LARGE TVs, not to forget the huge array of DVDs & books! The house sits in a lovely quiet location, with double gates to lock u away from the world. Every day we sat outside to eat under the covered dining area and I hv to say the photo does not do it justice, it's larger than it looks. Every day we hit the swimming pool, morning, noon or evening, fabulous space, good size, lots of loungers, lovely view and completely private. I would say it's very tranquil, but, with 3 kids in the pool I think I'll leave that bit out! BUT, yes, it's also very peaceful down there too. We were a goup of 7, 4 adults, 3 kids and there was more than enough space with plenty left over. The house is close to a lot of points of interest, even the Loire is only 1.1/2 hours away, with La Rochelle an hours travel, but, if you don't wish to travel that long, no problem, Puy Du Fou (a must) is only 40 mins away whilst closer to home there is a plethora of go sees. Very pretty countryside and some great eateries too, although, the best food was cooked on the barbeque (of course!). Fabulous supermarkets in either direction. You will absolutely not be disappointed renting this property. The holidays that we book are 99% holiday rentals (and we have rented a lot) and I can honestly say I give this 5 Stars (+1) ;). Hi, we are really pleased that you had a great holiday and many thanks for the detailed review, hopefully we will see you again in the future. Fantastic holiday home with everything you need! A fantastic holiday home with everything you need for a thoroughly relaxing and enjoyable stay. The pool area is outstanding and all of the facilities in the house are of a very high standard. Will definitely visit again! Many thanks for your kind comments, glad you enjoyed your stay and look forward to your return. The Vendee offers a fantastic coast line most of which is accessible in under 1 hour by car. The beaches are many and varied and we would recommend reading our visitors book on arrival which is full of recommendations. La Rochelle and Nantes airports are approxinatlely 1 hour away. By car the house is 260 miles from Roscoff (approx 4.5 Hours) and 250 miles from Caen, Most of the roads are dual carriage way or motorway. Due to the location of the property we would advise that a car would be required. The charming town of Chantonnay is about 5 miles away and offers supermarkets, banks, shops and restaurants. The Grand Park at Puy Du Fou is less than 1 hour away and is a must visit, has been voted best theme park in the world 2012, ensure that you allow at least 1 full day to visit this attraction, there is nothing in the UK to compare this to and we guarantee you will not be disappointed. There are no shops in La Reorthe, there is however a boulangerie in the next village (Feole) which is 3 minutes by car or 5 minutes on bike. For the more serious shopper La Rochelle is 1 hour away by car and has many designer and boutique shops as well as a fantastic choice of restaurants to choose from. Booking Notes: Please phone or email to make a booking, we take a 25% deposit at time of booking and full payment is required 6 weeks before your holiday. The full terms and conditions are available on request. Please note that our change over day is Sunday (2013 onwards). Changeover Day: The changeover day is Sunday (2013 onwards) and we kindly request that vacating guests depart by 10.00am. New guests should not arrive until after 4.00pm to allow the property to be cleaned and prepared. Notes on prices: Prices are for the property per week in UK Pounds. Prices include all bed linen and end of let cleaning. There are no extra charges for water or electric or logs if used. WiFi is provided free of charge as are phone calls made to UK landlines. Please note that we do not provide towels.